This spring, taste your way through these cities with guided walking tours. 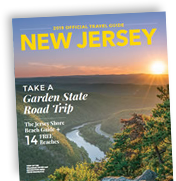 Enjoy the warmer weather of springtime, all while experiencing the sights, history and culinary specialties of New Jersey’s small towns when you take a guided food tour. These walking tours include samples and small bites at a variety of local restaurants, and your expert guide will show you the way while sharing interesting facts and stories about the city. Bring some comfortable shoes—and your appetite! Just across the Delaware River from each other, sister cities Lambertville and New Hope are full of incredible history, culture and culinary delights. Explore these two cities and take in the breathtaking views, boutique shopping and the mouthwatering cuisine on a guided walking tour of both cities. You’ll cover approximately two-miles over three hours and enjoy five different tastings along the way. Go on a self-guided tour throughout the town of Belmar, dozens of local restaurants will be participating in this four-hour, all-you-can-eat event. Restaurants from 10th Avenue include Burrito Company, JB Couture Cupcakes and DoughBoys Woodfired Pizza. Free shuttles will be circulating Belmar throughout the day, with stops centering from the Belmar Plaza parking lot. Explore the historic streets of Morristown with a guide leading the way. You’ll get to see the beautiful architecture of downtown, learn about the area and stop into six restaurants and food shops for samplings and small bites during this three-hour walking tour. Get the insider scoop on Montclair’s unique food scene, fascinating history and artistic community when you go on a three-hour historical and culinary walking tour through downtown. You’ll hear stories and sample foods from local restaurants. Discover Asbury Park’s vibrant culinary scene during the eighth annual restaurant tour, showcasing small "bites," samples and food demonstrations at more than 25 restaurants, lounges, juice bars and breakfast spots. Foodies will love exploring the range of options, from iconic restaurants to trendsetting eateries that are new to the scene. Want even more delicious places to eat when you visit? Explore the many restaurants in New Jersey.